Electric treadmill consumption: how much electricity does a treadmill use? A treadmill is a significant financial investment. However, spending is not over after buying the equipment. Perhaps you considered the cost of maintenance and repairs, but did you think about the electrical consumption of your treadmill? It will cost you from 50p to £1 if you use a treadmill an hour a day - if electricity costs 17-25p per kilowatt hour (KWh) given by the British media - taxes and incidental charges included. All electrical appliances, including the motorized treadmill, have a nominal power. This is the amount of energy consumed by the appliance. The most commonly used appliance is a microwave oven. The length of time it takes to cook a food depends on the wattage of your microwave oven. If you make the most of it, it consumes more but bakes quickly. Wattage on the treadmill depends on the type and size of the engine, among other factors. For all information, look for wattage on the label, on your machine, or in the user manual. Sometimes the watts are not expressed, but the rated voltage (V) and amperage (A) are expressed. By multiplying V x A, you’ll get the nominal value in W. Starting from the engine, a similar calculation could be made, considering 746 watts per each motor HP. Sometimes, however, on the engines are written too high (unrealistic) HP values ​​and therefore the calculation could be totally wrong. Suffice it to think that some engines have written 5 HP (peak), which correspond to more than 3.7 KWh, a value so high that the domestic power network would not be able to withstand! Most household appliances show a nominal consumption of 1500 to 2500W. This means 1.5 / 2 KWh per hour of use. The more you use the treadmill, the more energy it consumes. If an hour is 1.5 KWh, two hours are 3 KWh, and so on. However, depending on how much and how the treadmill is used, it also determines the amount of energy consumption. The treadmill engine (main power source) does not always use the maximum power. Contrary to what you might think, for DC motors, DC needs more power when you walk (and "drag" from the belt) rather than when running. In practice, max. 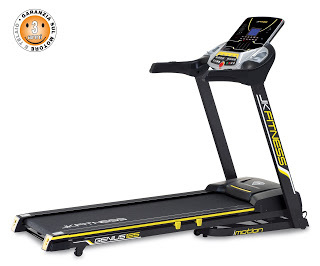 consumption is at its maximum speed, then it drops regularly to about ¾ of its maximum speed, around 10/12 km / h. So real consumption depends on the speed of treadmill, friction between the moving parts of the equipment (and especially between the belt and the deck) and the weight of the user. How to calculate the electrical consumption and the cost of using the treadmill? You can calculate the amount of "theoretical" energy that the treadmill consumes and how much it costs. You can not calculate realistically how often you use the full-capacity treadmill, so the following calculations are based on the full wattage. Multiply the power of your machine by the number of hours of use in a given month. Divide this number for 1,000 to get the total amount of kilowatt per month. Take an electric bill to calculate the total cost, an approximate system is dividing the total bill for n. of kilowatts billed. This will take into account some fixed costs but is a good approximation. Then multiply the cost of electricity obtained for KWh to calculate the monthly cost. How to reduce the consumption and therefore the cost of using a treadmill? Preventivemaintenance is the safest way to save. You have to think that ruined or worn components (deck, belt) or incorrect lubrication (excessive or insufficient) can double the friction factor between the belt and the deck. This is very important parameter and it’s directly proportional to the amount of energy used by the equipment and therefore power consumption. An old belt can therefore have a double friction factor and this results in a double consumption compared to a new low friction belt. In the case of time per day this may mean spending 1£ instead of 50p a day, or about 180 pounds per year. In addition, forgetting lubricating or replacing the belt, can lead to failure of the treadmill controller and engine, with significant recovery costs. Intertek, an important American research lab, has conducted an energy consumption analysis of treadmills. The study was carried out on a gym treadmill sample, as of course exercise in the gym is continuous and involves very high energy costs. Evaluation process: Each treadmill has been used for a 15 minutes heating period at a speed of 3.5km/h before recording all the values. The same user, 100kg weight, on the various treadmills throughout the testing process. It should be specified that it is a professional treadmill, with AC type motor. The treadmills evaluated were Life Fitness Elevation Series 95T Engage Treadmill, Technogym Excite Run 900E, Star Trac P Series, Precor 932i and Matrix T7xe. The actual observed consumption was between 300W/h (0.3 KWh) at 1100W/h (1.1 KWh) according to the conditions of use.